A keen lover of shaking things up in my perfume collection, I thought I'd share the perfumes I'm currently using and some that are on my list to try next. 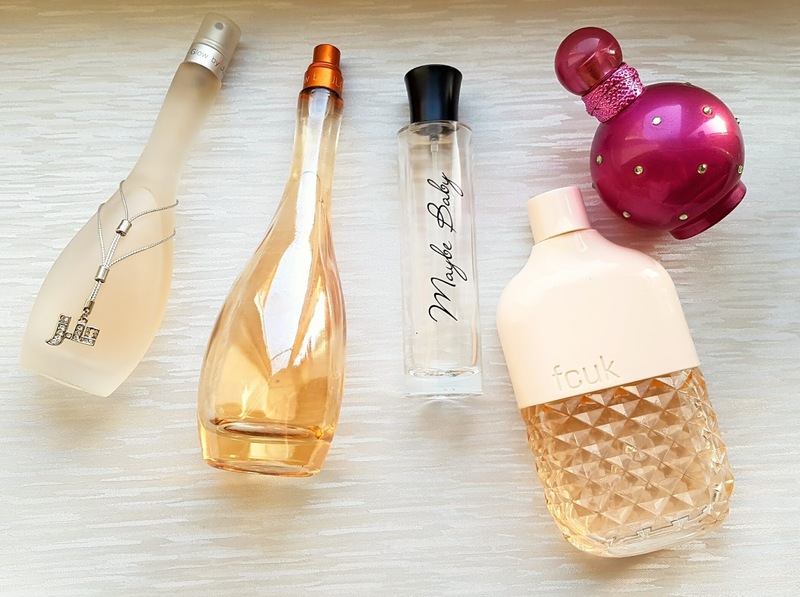 My scents tend to change from season to season and day to day. Currently, I've refound love for the good ol' JLO Glow scents, the Miami Glow (the gold one) reminds me soooo much of holidays. Then my sweet scents Benefits Maybe Baby, Britney's Fantasy and Fcuk Friction (for when I want a more musky scent) and surprisingly it's lasting forever. Scents on my list to try next.. I've been looking at the new L´Occitane fragrance* range inspired by the South of France. They even have cute packaging. For me, particularly the fruity Cherry Blossom roll on has caught my eye. Although, they come in a spray/solid/roll on I think I'd prefer a roll on perfume to a normal spray one as I usually spray way too much, plus their smaller so easy peasy to pop in your handbag and perfect for work or even to travel with, no more perfume spills in your suitcase. They do a Rose scented one too! Who doesn't want to smell like roses, right? Do you like to try new scents or stick to a particular fragrance? Or if you've tried any of the scents from the new L'Occitane range? Also have you tried a roll on rather than a spray? If so let me know if you prefer them.